Spring has left us in a blast of chilly air and stinging rain. We’ve had one of the wettest Novembers for quite some time. The first day of summer here in Sydney is not impressive. Showers are falling, the wind is howling, and it’s cold and dreary. But hey, the appearance and disappearance of the seasons (especially if they come and go in one week) are to be tolerated. This, according to Bhagavad-gita, my textbook for daily living. So enough about the weather. 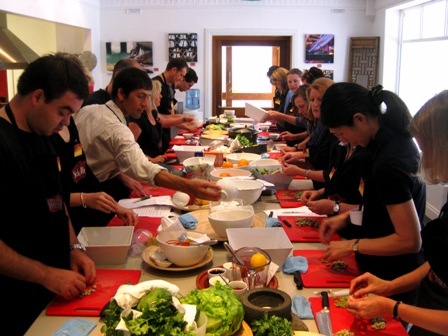 Let’s get back to the topic – my final cooking class weekend for 2009, held at the Sticky Rice Cooking School in the Adelaide Hills. 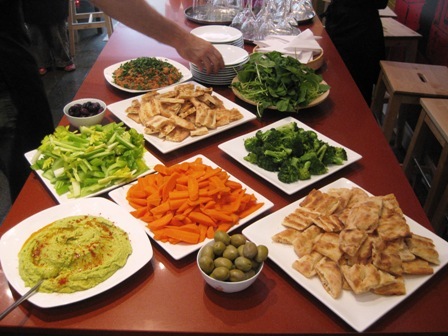 The first day’s menu was Vegetarian World Tapas. We had a lot of ground to cover so we worked our 16-strong team hard. 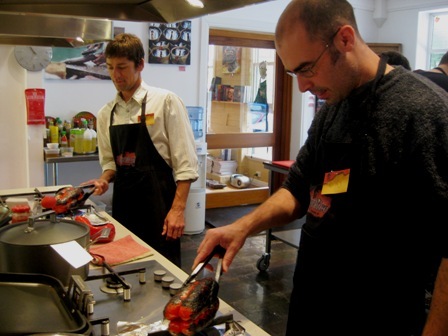 Here’s Andrew and Gary roasting red peppers over a flame to scorch off their skin (the peppers, not the lads). Morning snack consisted of our Syrian Roasted Red Pepper, Pomegranate Molasses and Walnut Dip (Muhammara), a delightfully fresh broad bean dip (Bissara) accompanied by blanched carrots and broccoli, celery sticks, lightly dressed rocket leaves, olives and toasted Lebanese bread. Nice and fresh and healthy. Sunday’s session was a lot more relaxed. Here’s our team chilling in the lounge before class. 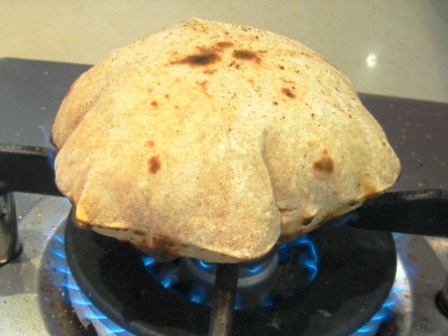 There are a number of secrets in making perfect chapatis. For a start you need good atta flour. We started with some Shaktibhoga Atta, a nice imported brand from India. 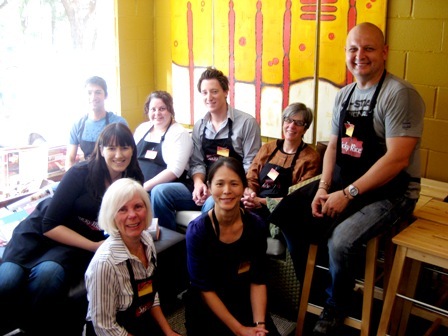 Our dough was very moist, and we rolled in plenty of flour to stop the chapatis sticking to the bench. 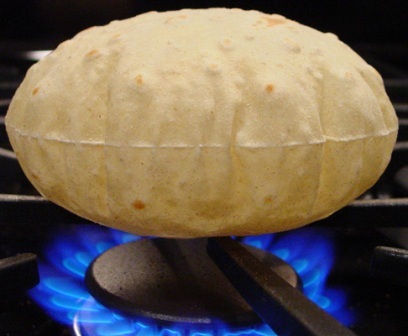 Generally the rule is: a soft dough will yield soft chapatis. A good number of our breads puffed up while even on the pan. That’s always a promising sign. 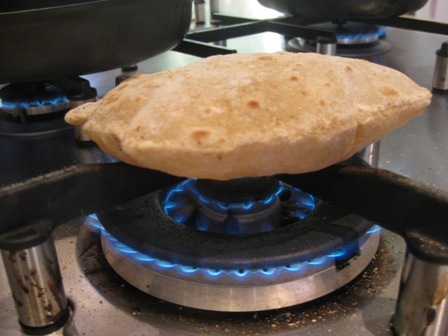 A quick transfer to a naked flame fully inflates the chapatis to bursting point. 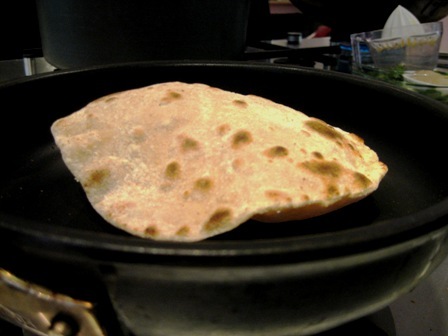 Slathered in butter, a warm chapati is a special treat! 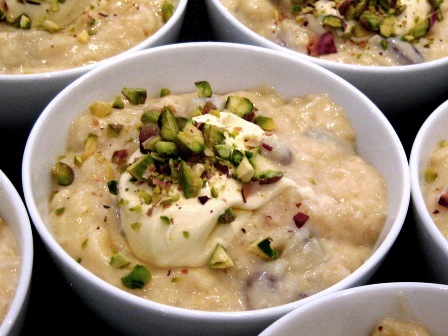 Our Pakisthani-style wheat vermicelli kheer (a rice pudding-style dessert using pasta instead of rice) was a great hit. We toasted slivered almonds and raisins in a little French unsalted butter, added some thin wheat vermicelli, pistachios, milk and cardamom. The mixture was simmered over a low heat until it reduced to a moist pudding. Sugar, cream and a splash of good quality Lebanese rosewater completed the kheer. Served with a dollop of 48% fat content cream, a tiny splash more rosewater and some pistachios for garnish, and there it is – a right royal dessert. That completely obliterated our team who staggered home replete and promising to return again next year. So be it! Om Tat Sat.